August 20, 2014 (Boulevard) – Lansing Industries and related entities have filed a lawsuit against the County of San Diego and public officials including Supervisors, Boulevard Planning Group Chair Donna Tisdale, Supervisor Dianne Jacob, and County Planning Chair Michael Beck. In addition, the suit names the Endangered Habitat League and two groups fighting to protect rural landowners: Protect Our Communities Foundation and Backcountry Against Dumps (BAD). Greg Lansing and/or his entities acquired Big Country Ranch in 2006 and Empire Ranch in 2007 for a combined 6,280 acres, later adding additional parcels for a grand total of 8,000 acres in rural Boulevard. He proposed grandiose plans to rename the town Jewel Ranch and create a master planned residential community complete with a shopping mall, Vons grocery store, private fire and law enforcement, improved infrastructure, medical facilities and trails, according to minutes of the Boulevard Planning Group from January 3, 2008. After those plans failed to win approval, Lansing, who does not live in Boulevard, later tried unsuccessfully to bring industrial wind or large-scale solar projects to his sites. The suit seeks over $100 million in actual and punitive damage for alleged property loss due to changes in the County General Plan that down-zoned from 1 home per 4 acres to just 1 home per 80 acres. Lansing’s suit claims that the county did not provide adequate opportunity for public input before changing the General Plan and abused its discretion by approving the changes. He accuses Jacob of stating that down-zoning was not a foregone conclusion while instructing staff to prepare only low-density proposals due to water supply concerns. He blames Tisdale for the fact that only 200 of Boulevard’s residents signed a petition asking the County to reject the down-zoning proposal. The suit states that Tisdale authored a letter on behalf of BAD calling Lansing a “snake oil salesman” and that suggestions that claimed he would allow aggregate mining or a prison on the site if his project wasn’t approved were false and intended to intimidate residents. But meetings of minutes from a public meeting, a U-T article from January 2008, as well as recollections of some local residents who attended private meetings held by Lansing with some area residents tell a different story. The newspaper article indicates that only two people spoke in favor of Lansing’s development plan. One of those was John Gibson, who himself has engaged in some verbal bashing of Tisdale. As ECM previously reported, at a May 2013 hearing by Supervisors on a proposed wind ordinance, Gibson, who represents the Hamann companies and had a vested interest in wind energy development, likened Tisdale and others opposed to wind projects to the Boston Marathon bomber. 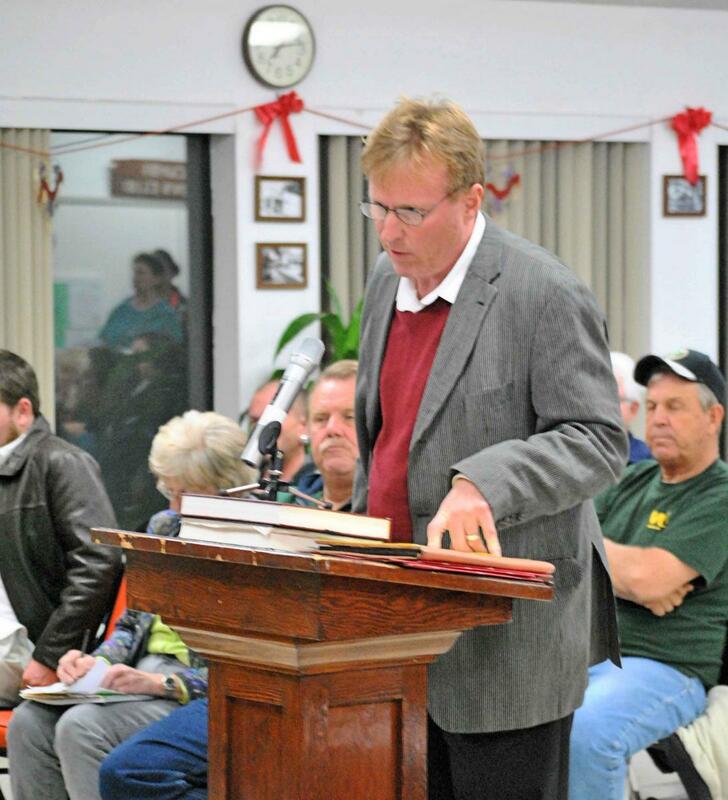 He stated that opponents of the Wind Energy Ordinance were “like people with a pressure cooker and ball bearings with a bomb, trying to stop the projects…This is economic terrorism.” Residents, however, overwhelmingly gave testimony revealing serious concerns about such projects, suggesting that they were the ones feeling terrorized by large energy developments and landowners who did not show concerns for public health. Lansing himself has testified to the California Public Utilities Commission in favor of both the ECO Substation and Tule Wind project slated for McCain Valley – two projects that are overwhelmingly unpopular with local residents due to the destruction of rural land, heavy water use and in the case of Tule Wind, massive industrialization of a scenic federal, public recreation area. Many voiced concerns about water issues at the 2008 Boulevard meeting, the UT reported. Residents doubted Lansing’s claims that studies showed adequate water. Water has been a hotbed of contention over several major projects in the region and residents have cause for skepticism of developers’ claims. SDG&E used three times more water than it estimated for its recent ECO substation project in the area. More recently, serious credibility doubts have been cast on SOITEC solar’s water use projections made by a company with a track record for missing the mark by a country mile on water usage estimates. Boulevard Planning Group minutes indicate a large turning at the meeting where Lansing made a presentation in January 2008, with the vast majority opposed to the project. Concerns cited included traffic, loss of rural character, water usage, and loss of small businesses if a mall were built. Lansing failed to answer many questions posed. Moreover, the community had voted in slow growth “to keep Boulevard rural,” the group’s minutes state. I attended the first meet and greet that Lansing held to introduce himself and his plans to our community. When my family and our neighbors pulled up a front seat we saw a map of his proposed project area. Low and behold what did we see but "OUR" (meaning plural)properties on his map. You can imagine that to anyone this would be upsetting. During the question and answer section of his little speech we asked him why we were on his little map. He said that it must have been a mistake, I'm sorry really a mistake. A man who plans like this and paid that much for his project to be outlined by engineers doesn't make this kind of mistake! He planned on taking our properties and building this big housing development without consideration of the community or the effects. The water draw down for his big project alone would greatly impact our community. We (several of us who were on his map) announced that we would never sell. Then children of the land owners and grandchildren stood up and stated that we would never sell! I think he was trying to prey on the fact that most of the properties he listed we all elderly owners but didn't take into account the people to inherit would never sell. At this point the rest of the crowd was less than receptive and he called us a bunch of back country hillbillies who didn't know a good thing when we saw it. He then told us if we stood in his way building his massive housing development he would sell out to the wind industry and help ruin our small town but he was going to get his money one way or another. He threatened us!! As you can imagine as a community we stood against this man and his self righteousness thinking he could take our homes and ruin our community. We donated money to file lawsuits and do what ever it took for this not to happen. You see we love where we live. We moved here on purpose bought a home in the country built it with our own blood and sweat, we have animals, gardens, we like our life style here good and clean. We want to raise our children in a small quiet town where people know one another. We pay to drive to town instead of living there where it could be convenient. I pray that good will win over evil and that he would he would see the error of his ways and not fight this fight sell out and leave if he doesn't want to be a constructive part of this community. Oh I forgot he doesn't live here. The housing project in Campo (which is much smaller) is already in lawsuits in. The well has dried up several others and people have left those homes vacant. We have another solar project that just got closed because it was drawing down the surrounding wells especially in tough drought times like these. Thank you for listening to my take on this situation. Lansing has it backwards. It sure would be nice if a lawsuit such as this could finally end the political war that has been going on for years now over the future of Boulevard and McCain Valley. I agree with the residents that the area is SPECIAL, JUST THE WAY IT IS and should remain that way.